Mayan Name: TZ´IKIN / Men. Compatibility: Eagle, Storm, Night, Deer, Monkey. In the Mayan calendar, the Eagle (Men) sign is the most powerful, uniting in itself the symbolism of the Sun and the Moon. The meaning of the sign is the eagle, the patron is the Sun God Hunahpu Ahau, Kukulkan. The hieroglyph of the sign is the face of the Moon Goddess, which the ancient Maya was considered to be the embodiment of wisdom. In ancient myths, it is known as the Woman-Eagle, whose head is adorned with feathers. This indicates its connection with the sign of the Eagle, which the Indians correlate with the Sun. So there is the image of unity and integrity: the Sun is the masculine principle, the Moon is the feminine principle. Modern Maya Indians call the day Tsikin, in literal translation — a bird, but usually denoted as the sign of the Eagle. Thus, Men — a sign of wisdom, purposefulness. 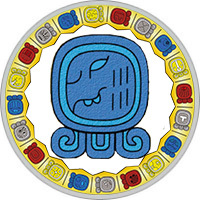 The Maya horoscope characterizes the person of the Eagle’s sign as a born logic. His distinctive qualities: a wonderful memory, sharp mind, calmness, endurance. Therefore, in the eyes of others, people look like a person without any feelings. But this is not so: Eagle is a sign of passion and desire. And most of all it craves public recognition and material wealth. He tries to rise, "soar" over the crowd. The people of this day so easily realize everything conceived that they begin to believe in their own exclusiveness. Self-love, rancor, ambition are traits that create difficulties in communication. Often live life alone, seek comfort in alcohol or drugs. According to the horoscope of Maya, the person of the sign Eagle is a predator, so pleasure does not come from victory itself, but rather the way to it. Possesses endurance and patience, he is credited with a mystical gift to fulfill his most secret desires. He is considered an excellent specialist, he is appreciated in professional circles. A strong character, strong will combined with natural luck lead to the heights of a career. Successfully realizes its talents in many fields: science, finance, politics. According to the horoscope of the work, the representatives of this day feel best as a leader or a free artist. They are not capable of obeying and conceding, their opinion must be decisive. The person of the sign Eagle is a bright individuality, a loner by nature. The representative of this day is so confident in his abilities, is focused on his own feelings, which is difficult for people to agree with. In loving relationships, he shows characteristic hardness and stubbornness. He does not perceive the elect as an equal partner, he is a complement and an appendix to his exceptional personality. The love horoscope characterizes the person of the sign Orel as a passionate, sensual nature, while not denying self-love and selfishness. In Maya calendar the Eagle is a sign of fullness, integrity, therefore the man of this day is a self-sufficient person. Observes a reasonable balance between the physical and spiritual world, but sometimes loses the ability to resist the "dark" side of his personality. In this case, is fond of alcohol or has many love connections. According to the horoscope of compatibility, he is approached by a faithful partner who has patience, capable of sacrificing for his sake. He is ready to devote himself to his chosen one, but he will not be content with a secondary role, he is the leader in romantic relationships. According to Maya horoscope, the woman of the Eagle sign is a mysterious person. Endowed with qualities inherent in a greater degree to men: iron willpower, firmness, determination. Due to persistence and purposefulness invariably succeeds, quite often she is a famous person: a politician, a public figure. In this case, the predator by nature can create the impression of a feminine, fragile person. Talent manipulates the feelings and emotions of his partner. But often she lacks the patience or desire to bring the game to the end, quite comfortable feels, being in proud solitude.